I love this executive summaries section at the end of the paper version of the Harvard Business Review. I don’t know if it has been running for years or just started, but it’s very useful in helping decide — do I want to give these X,000 words my attention? They should put it up front really, to make it even more useful. When Microsoft’s new CEO was announced last week, there was a great deal of commentary about his – doubtless very carefully crafted – introductory email to the company. Many who know me say I am also defined by my curiosity and thirst for learning. I buy more books than I can finish. I sign up for more online courses than I can complete. I fundamentally believe that if you are not learning new things, you stop doing great and useful things. So family, curiosity and hunger for knowledge all define me. There are two things that make me like Mr Nadella a bit from reading that quote. First: I do that too. Last night I flicked through the books on my Kindle – there are so many interesting ones there that I’ve barely started or not started at all. It’s a teetering, digital monument to curiosity and to having an appetite for learning that is beyond my current means (in terms of time, mainly) to support. The second thing that warms me to his statement is its echo of what I was talking about in my post last week, Finishedness – realising that you can’t, and often shouldn’t, finish everything that you start. This ability is strength, contrary to the puritan work ethic/completer-finisher fallacy. 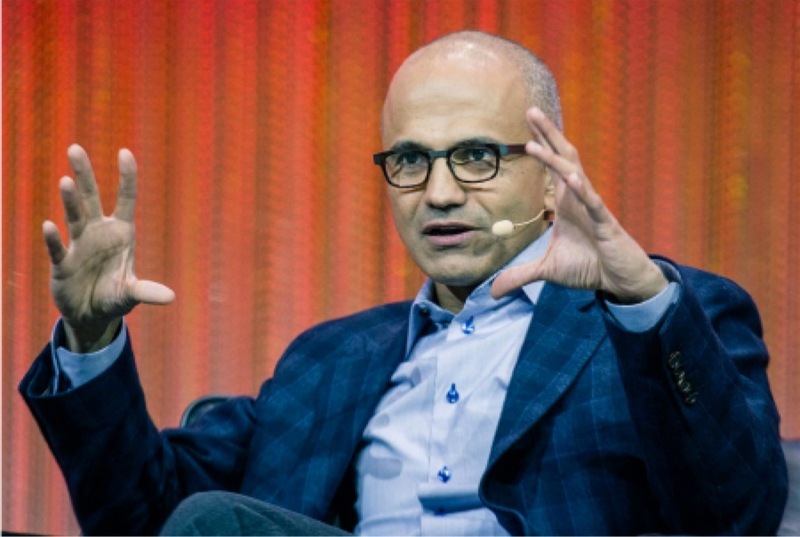 Mr Nadella’s email was a positioning exercise – mainly in distancing himself from the style of his predecessor, the bombastic Steve Ballmer. The latter didn’t talk much about his reading habits – and would be more likely to reel off the number of books completed – a PB roll-call of reading velocity. In the age of digital superabundance of information, leaders must be curious and hungry to learn, but also mindful that they cannot hope to read everything, to learn everything that they would like to. It’s the larger scale version of FOMO (fear of missing out) – applied to thinking and knowledge rather than social network updates, but the same in essence. Mr Nadella’s statement shows self-awareness, acceptance of his limitations and a desire for continual learning. Whatever he does with Microsoft in the next few years, in this aspect he has the right stuff to be a digital leader. Image credit: (cc) Official Le Web photos. As cheerleaders for incumbent media often point out, the old is rarely replaced by the new. Newspapers weren’t killed by radio, radio wasn’t killed by TV, TV wasn’t killed by online video – etc., etc. Sometimes new technology boosts the old. Printing pushed up demand for paper throughout Europe, encouraging production and making it cheaper (its price fell by 40 percent during the fifteenth century) and more widely available. Printed books promoted literacy and writing manuals could be produced in quantity. We can see a similar effect today with writing and books. Earlier in Writing on the Wall, Tom Standage notes that book writing was a serious undertaking in Roman times. You had to be literate, rich enough to have a dedicated cohort of slaves for scribing and couriering purposes during the research, notable enough to throw a top-notch launch party and – by some advice of the time – spend about nine years perfecting your manuscript before releasing it into the network of copyists (all reproduction was by hand, of course). Now writing – and publishing – books is within the grasp of anyone. A cynic would say that you don’t even need that high a degree of literacy. The exclusion of hundreds of thousands of titles published without an ISBN, including many titles on Amazon’s Kindle store, means that the increase of 422% since 2007 this represents is likely to be an underestimate of the size of the self-publishing sector. Rather than reach for the pessimist’s fall-back of the monkey-typewriter paradigm, recognise this for what it is – a golden age of reading and – even more – writing. New forms of media are making old forms easier for everyone to access and work with, once again. A neuroscience research project suggests that when we read novels we create a connection with the protagonist, a change that is visible in fMRI brain scans and that persists for five days. Read with all the usual caveats – a single study, filtered by journalists etc. – but I like the idea, any reader would agree: a good book changes your mind, puts you in an altered state. What's interesting about the study of course, is how long the effects seem to last. I'd love to see a similar study for watching a good film. Image: A profile of Jack Reacher by Lee Child, his creator, on the Mysterious Bookshop imprint. When I look at Maria Popova and her work on Brainpickings, I feel admiration, inspiration and a little jealousy. She takes something that is important to me – blogging, writing and the collecting of fascinating things – to a logical extreme, making a profession of it. She’s made a life and living out of sharing insights and ideas about writing, reading and thinking. It was interesting to say the least to read an interview with her on Copyblogger. The post begins with her description of herself – “A reader who writes” – which gives a nice perspective on how she thinks about her work. I’m not an expert and I aspire never to be one. As Frank Lloyd Wright rightly put it, “An expert is a man who has stopped thinking because ‘he knows.’” Brain Pickings began as my record of what I was learning, and it remains a record of what I continue to learn – the writing is just the vehicle for recording, for making sense. That said, one thing I’ve honed over the years – in part by countless hours of reading and in part because I suspect it’s how my brain is wired – is drawing connections between things, often things not immediately or obviously related, spanning different disciplines and time periods. I wouldn’t call that “expertise” so much as obsession. Lastly, I like the discipline that accompanies her obsession. There’s just one way through a block, she says…. As I say, I completely adore her work, both the output and her approach. Part of me dreams of following the path she has, of giving myself over to the reading and the writing. But, I’ve chosen my path and for now other passions take the centre stage of my attention and the majority share of my time. Living with ebooks, as I have been since I bought my first iPad a few years back, has changed my reading. It’s also given me more ways of understanding how I read and how I want to read. Let’s get the nostalgia out of the way first. I miss paper books. I still read paper books, occasionally, but usually for specific, diminishing reasons. The first reason is that I can’t get a Kindle version of a book, or I already own the paper version. Both of these reasons are diminishing: the former because more and more books, even ones that were out of print are becoming available electronically; the latter is less of an issue as time passes because, due to the convenience of ebooks for note-taking, portability etc., I will sometimes buy ebook versions of the paper ones I own – if I’m using them for reference on a project, for instance, or in a couple of cases of fiction, because I love them so much and I want to have them with me when I’m travelling or just not at home. At least that’s the case for non-fiction – sometimes, I love to read on paper. I think of it as hi-fidelity reading though – it’s a luxury, a treat – about time and place as much of the medium. I’ve always read several books at the same time. Different books for different reasons and different times of day – some for projects, some for things I’m studying, some instructional, some fiction. With ebooks this habit has continued but with the number of books expanding even further. I’ll read some in bursts and then put them aside for a few days, weeks or months, and then pick them up again. The other habit that has continued from reading paper books to ebooks – and been similarly exaggerated in the transition – is not finishing them. Business or popular science books that lose their hold on my attention halfway through, get left behind, put on the virtual shelf. I used to feel bad about not finishing books, but this was some kind of a vestigial puritan instinct, something about not letting things go to waste, finishing what you’ve started. Really, it’s a healthy habit – not all books deserve to be finished, not all need to be finished. There are other things you could be doing. Rather than asking myself “why don’t I finish books?”, as if I had some kind of reading disorder, or lacked moral fibre, it is much more interesting to ask: “why do I finish books?” and then to wonder what that tells me about good writing. Not finishing books is mostly a non-fiction phenomenon. Fiction books pull me through to the end with plot, with their beginnings, middles and ends. Non-fiction books rarely pull that trick off and very often fail to cohere past the first third. 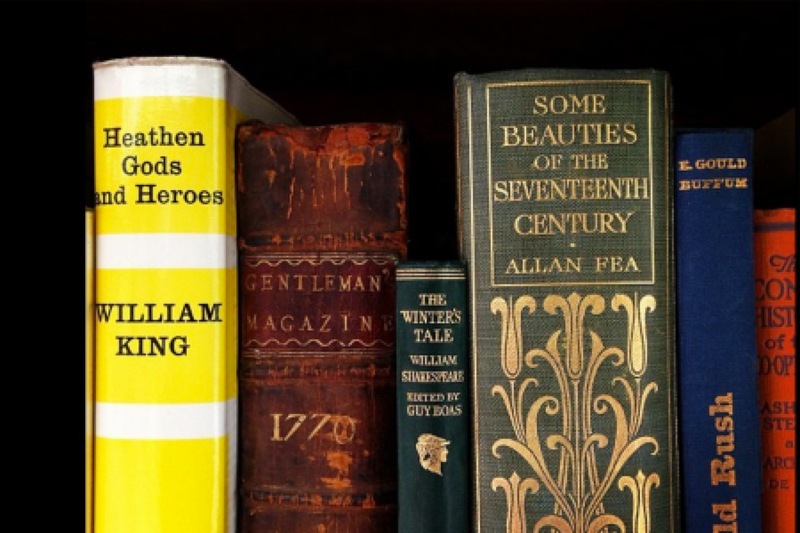 A good many non-fiction books would benefit from being either shorter or serialised – Kindle singles hold some promise in this area, thought I’m not sure how well that format is doing. Not every non-fiction work needs to be 60,000 words plus (the minimum length for most paperbacks). A great example of an author showing restraint is Paul Adams’s Grouped, which is exactly the right length for what he has to say about social networks – about 45,000 words/170 pages. To hold our attention and to be useful, books should be useful in every chapter – I’m not sure that this is the case. I think they get padded – stretched to fit the format. Chunking things up in to 10,000 word segments would suit readers and save authors a lot of time too. 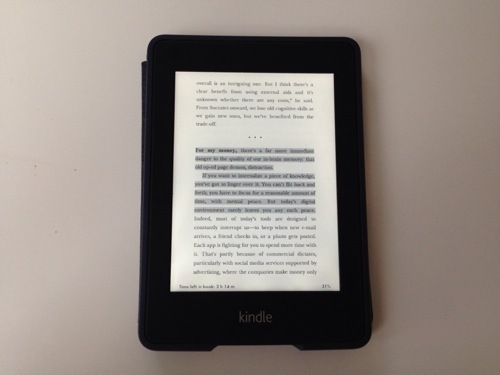 Whether new lengths and formats catch on for ebooks is something I’m watching closely. Especially as I definitely have another book in me right now – I just need to decide how it should come out, as it were. The paperback book I am reading right now is The Big Sleep and Other Novels, by Raymond Chandler. It’s a lovely Penguin Classics imprint, thick and light and good to hold. I bought it a month ago in paper version because I want to read it slowly, closely (as Francine Prose recommends). I first read Chandler when I was thirteen and fell in love – deeply – with his style. Coming back to it now is thrilling, especially taking time to read it word by word, feeling the shape of the sentences and paragraphs, letting the bright, colourful imagery hang in my mind for a few moments. Chandler writes in high definition. It’s prose that you want to play out on the best possible system: a relaxed mind, a calm room, off an analogue page that has texture, where the text has been imprinted. I’m a reader and sometimes a writer, much more than I am a muso or a musician. So a paper page, read in a softly lit bedroom or attic study, with a warm drink next to me and near silence in the house – that’s the equivalent of an audiophile putting a vinyl disc onto a high-end turntable, connected to some valve-driven amp and played out through some speakers that cost as much as your car. In case you are looking for some ideas about what to read in the remainder of the summer, here are the books that have tickled my fancy over the summer months. Autobiographical story – interspersed with transcripts of some his shows – by my favourite stand-up comedian/ The book recounts his seeming career collapse, re-invention and return to stand-up comedy. Take that it is utterly hilarious throughout as a given. Beyond that, what it gives a really interesting insight into the business of comedy and Lee’s creative/artistic methods. It doesn’t set out to be be or ever really use the tone of a profound book, but it is – there’s rich inspiration and example here for anyone thinking about being true to their own ideals or trying to remember, re-work what they do for a living. A book about writing fiction by one of my favourite crime authors (Lawrence Block wrote the amazing Matt Scudder series, set in late-70s, early-80s New York – well worth tracking down). Like How I Escaped My Certain Fate, it sets itself against the conventions of its genre, for instance stressingjust how hard writing is, what a work of hackery pulling together thousands of words is, truths I can attest to after my own non-fiction effort. This is one of a number of books I’d read, or at leat read in part, before. Again, a joy of the Kindle is that I re-visited it on a whim, re-downloading it from my archive while away on holiday. An account by Jon Ronson of his research into the tickbox method of diagnosing psychopathy as a condition. Along the way he prods at fascinating subjects like the way that all mental illnesses are categorised (by some shouty psychaitrists in a small meeting room was the original approach a couple of decades ago – loudest theories win) and how madness exists at the edges of many people’s lives. This is another book I pulled back out of my archive, partly because it speaks to a strategy project I’ve been working on and partly because it felt like it was time to revisit the source material for some ideas that have been exerting a strong pull on a lot of my work. It’s a business book, pure and simple, about how innovation and markets are speeding up as a consequence of the social web, and what strategies organsiations can put in place to thrive in this environment. Business books I read all the way through are a minority. This is one of an even rarer breed: books I re-read… Probably as important to me now as The Origin of Wealth has been for the past half decade or so. Design thinking has come in for a bit of flack lately, but it still stands as an amazingly useful way to approach any challenge, from designing a physical object to planning a marketing campaign. 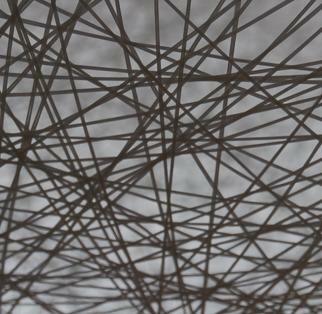 I’ve put the ideas to work in refining my Networks Thinking perspective and in designing the next phase of my business. Books as Makers of Publics – Jeff Jarvis talks at an O’Reilly conference on the changing business of publishing. Especially interesting to me when I’m working on the outlines of my second book after Me & My Web Shadow. 54 Tips For Writers, From Writers – I don’t write fiction (at the moment) but I still love to read and hear how writers approach their work. Filing this one under insipiration.